I was just reading about how we are now moving into the Zodiac sign of Libra which is the balance sign. Fall has just begun in our region so change is in the air. This is a great time to think about how well we take care of ourselves and to look at the balance in our lives. I know that if I do not have good balance in my life I feel a bit cranky. I might not even know what is wrong, but I am just short with myself and my loved ones. I start to feel that I have no control over my life. Our strengths rely on this balance. Balance creates a stability for us. Sometimes, I find that some of the people I am helping think that they need to be working on their clutter all the time. And I know that when our lives are feeling chaotic it is hard to think about more balance. But of course we cannot be focused on the hard things all the time. We need Balance. We need to look at all of the areas of our lives and think about what might be out of balance. This gives us a clue to work on this area and tip the scales in our favour. We know that we need to recharge before we can be productive, creative, helpful to others or to declutter our own homes. These are the areas that are basic to our lives. Think of these as foundational practices for taking care of you. 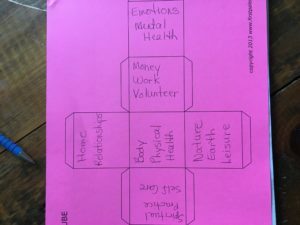 Check out this cube and perhaps draw one for yourself or if you have a small box that will work too. What are the foundations for your life, your relationships, your home, your health and your work? What kind of supports would help you in your life? Do you need/want more honest friendships, a satisfying job, better health, etc…………..
What can I focus on in my live right now to create more stability in my life? What areas are out of balance? How has balance played a part in your life? These are great questions that you pose. And I love that cube/box idea too, which distinguishes the different parts of our life. Balance is a continually shifting thing. When we focus too heavily on one area of our life, it’s pretty easy for others to get out of whack. I’ve noticed that there are “seasons” of where our attention and focus lay. Sometimes we are more “other” focused, and sometimes more “self” focused. It just depends on what is happening in our lives at that time. I love the idea of using the seasons to do a bit of a check in to see where we might need some rebalancing. I have actually done this exercise with a group of women before and it is always impactful. I found that doing the cube was a real hands on exercise that is fun. You could even do a mini collage on the different sides. I love the idea of connecting this exercise to the seasons. Thanks for your comment. I so agree with Linda’s comment about there being seasons of life that can draw us out of balance. I have friends to go away for a weekend each year to talk about their priorities, each of their children, their hopes for the year, etc. I think the idea of identifying where life has become lopsided could be part of an exercise like this. We can then be mindful about restoring that critical balance. 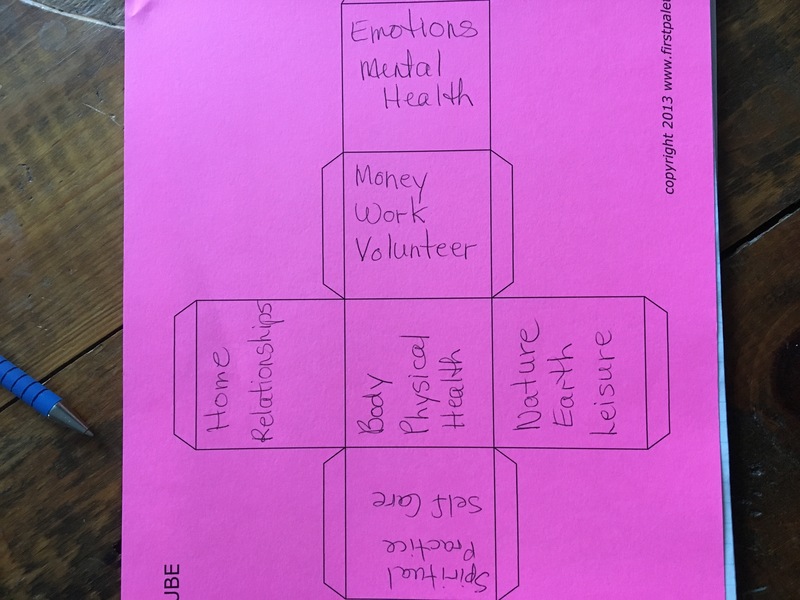 Seeing the box is a great way to visualize the importance of giving each area a fairly equal amount of space in our lives. Yes, this is a great exercise to do with a group of women. The box is a great visual for those who are more visual hands on learners. As I said to Linda, you could also do a small collage on the different areas. That could be fun but can be overwhelming for some. Thank you as always Seana for your comment. I agree! Balance is essential. We can’t do it all, all the time and that is OK. The trick is not to judge ourselves when we are a little off balance. Asking the questions, you mentioned above to oneself will allow us the opportunity to find the way to get more balance in our lives. Thank you for the reminder.